A momentous meeting of the mindful will take place November 15 when pioneers of the Western meditation and mindfulness movements come together for Living with a Joyful Spirit and a Wise Heart, a day of celebration, stories, teachings and practice at the Broad Theater in Santa Monica, CA. Four decades ago, these men and women -- after years of study and retreat with Buddhist masters -- set out to bring the values and benefits of Buddhist mindfulness meditation to the U.S. Their lives, friendships and careers have intertwined ever since in various combinations, including the founding and nurturing of such notable foundations and retreat centers as Insight Meditation Society in Barre, MA, Spirit Rock in Woodacre, CA, Seva Foundation, Hanuman Foundation, Insight Meditation Community of Washington, and LA's own InsightLA. Science continues to spotlight the myriad ways in which mindfulness meditation practice -- sitting quietly and focusing on the present moment without judgment -- can change the structure of one's brain to reduce stress and create space for increased awareness, compassion and happiness. The mindfulness revolution spearheaded by those who'll gather on the Broad Stage has helped millions of individuals and is having a profound effect on institutions ranging from schools to medicine and business -- even the military. The practice of mindfulness (also known as Vipassana or Insight Meditation) may sound simple but it's far from easy. Trudy sees November 15 as an opportunity to inspire people to take on the challenges of living mindfully: "Mindfulness involves doing some hard things: sustaining attentiveness and wise focus, and taking compassionate responsibility for how we live in relation to ourselves, others and our world. We need inspiration to get motivated to do this!" Golden Globe Award-winning actor Sandra Oh will host the proceedings, including a special celebration honoring the 70th birthdays of Goodman and Kornfield -- two lives spent in service of sharing with the world joy, peace and relief from suffering through mindfulness. Trudy said, "Jack and I wanted to mark our 70th year by helping our community. Rather than simply having a birthday party, we decided to give what we love the most, a gift of mindfulness and awakening, from some of our beloved life-long friends on the path." Jack said, "When we asked ourselves what would make a best birthday celebration it was to touch the hearts and minds of all who participate. We will ask many of the wisest teachers of our generation to offer their most important essence teachings: After all these years of leading the mindfulness and spiritual revolution, what do you most want people to discover? How can we quiet our minds, open our hearts and live with joy amidst the wild modern world?" He added, "This is our idea of a cool party." The lineup for Living with a Joyful Spirit and a Wise Heart suggests a kind of Mindfulness Woodstock, so it should come as no surprise that Trudy created InsightLA with the DIY spirit of a garage band. After living and teaching in Cambridge, MA for 30 years, she moved to Santa Monica for family reasons. Knowing hardly anyone on the Left Coast, she started out by sitting with a couple of friends in a living room. Most of us Westerners dread getting old and squander valuable time and energy doing battle with or denying our inevitable physical decline and death. The mindfulness mavens on the Broad Stage will encourage us to dwell in and savor the present moment in all its groundless uncertainty. And age is, after, all, relative. Trudy recalls the teasing way her first teacher, the Korean Zen Master, Dae Soen Sa Nim, would tell her and her 20-something friends: "Soon dead!" 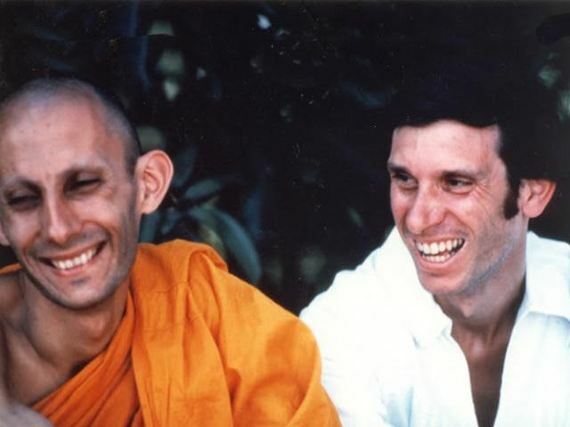 Jack Kornfield (left) poses the question, "Hey Joseph (Goldstein), do you think this mindfulness thing will ever catch on?" *Trudy Goodman -- click here for a recent PBS appearance -- was a psychotherapist for 30 years and practiced Buddhist meditation for 40 years with Asian and Western teachers. In the first years of Mindfulness Based Stress Reduction (MBSR), Trudy taught with its creator, Dr. Jon Kabat-Zinn. She has been the Guiding Teacher and co-founder of the Institute for Meditation and Psychotherapy in Cambridge, Massachusetts since 1995, in addition to her work at InsightLA. 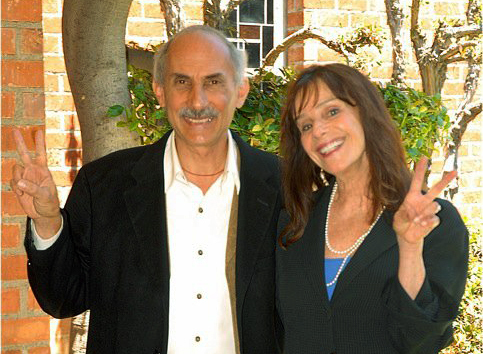 *Jack Kornfield -- one of the key teachers to introduce Buddhist Mindfulness practice to the West. In 1975, he co-founded the Insight Meditation Society in Barre, Massachusetts, with Sharon Salzberg and Joseph Goldstein; in 1987, he founded Spirit Rock Meditation Center in Woodacre, California. The author of many best-selling books, he serves on the Board of InsightLA. *Jon Kabat-Zinn -- creator of the hugely popular Mindfulness-Based Stress Reduction program now used by clinicians and people all over the world. Author of the bestsellers Full Catastrophe Living and Wherever You Go, There You Are. 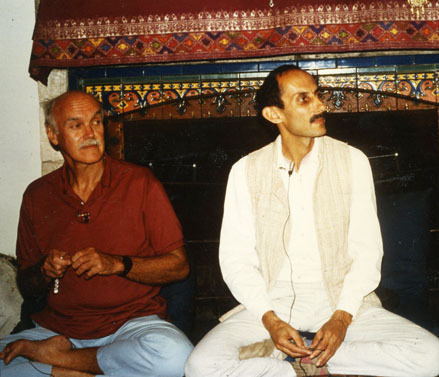 *Ram Dass -- one of the most influential American spiritual teachers of our time. Author of the seminal 1971 book Be Here Now. Founder of Seva Foundation, Hanuman Foundation and the Love, Serve, Remember Foundation. *Tara Brach, Ph.D. -- clinical psychologist/founder of the Insight Meditation Community of Washington. Among her books: True Refuge and Radical Acceptance. 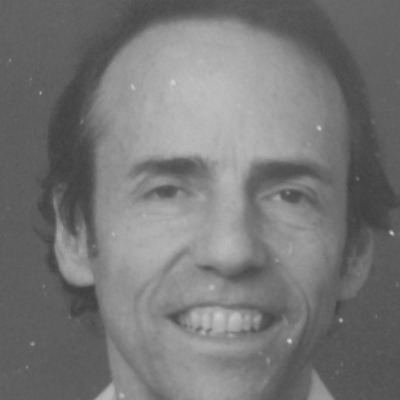 *Joseph Goldstein -- best-selling author/leader of Insight and loving-kindness retreats worldwide since 1974. Co-founder and a guiding teacher of the Insight Meditation Society in Barre, MA. *Congressman Tim Ryan (D-Ohio) -- Author of A Mindful Nation; proposed that meditation be available to Congress members at the Capitol. *A variety of meditation and mindfulness classes and sittings across the Southland, from Los Feliz to Santa Monica to Long Beach. *Trainings for professional staff at area Children's and other Southland hospitals; settings where staff are doing compassion-based work on the frontlines of suffering in our society. *Teachings to groups such as veterans with PTSD and the Downtown Women's Shelter. *Developing a residential retreat center in the heart of Benedict Canyon. *Offering financial assistance and events and classes at no charge for those experiencing financial hardship. Click here for more information.